In June 2017, the seventh season of excavations was conducted at Ḥorbat Ḥuqoq (License No. G-24/2017; map ref. 24500–50/75430–65; Magness at al. 2017). The excavation was undertaken and underwritten by the University of North Carolina at Chapel Hill, Baylor University (Texas), Brigham Young University (Utah) and the University of Toronto (Canada). Additional funding was provided by the National Geographic Society, the Loeb Classical Library Foundation, the International Catacomb Society, the Foundation for Biblical Archaeology (S. Bishop) and private donors. The excavation was directed by J. Magness, with the assistance of S. Kisilevitz (assistant director), M. Golan (administration), M. Grey and D. Mizzi (area supervision), J. Haberman (field photography), M. Robinson-Mohr (registration), D. Schindler (ceramics), K. Britt (mosaics), M. Wells (architecture), S. O’Connell (painted plaster), E. Hubbard (geoarchaeology and micromorphology), R. Mohr (drawing), V. Pirsky (drafting), O. Cohen (site and small finds conservation) and Griffin Aerial Imaging (aerial photography). The volunteers were undergraduate and graduate students from the USA, Canada and Slovakia. The excavation this season continued in Area 3000 (Fig. 1), where there are three main occupation phases: a synagogue from the Late Roman period (fifth century CE); a public building from the Middle Ages (twelfth–thirteenth centuries CE), which reused the Late Roman synagogue building; and the post-Middle Ages (thirteenth–sixteenth centuries CE) and late Ottoman–modern periods (eighteenth–twentieth centuries CE, up to 1948), when the robbing out and pitting of the public building were followed by the establishment of dwellings belonging to the village of Yakuk. 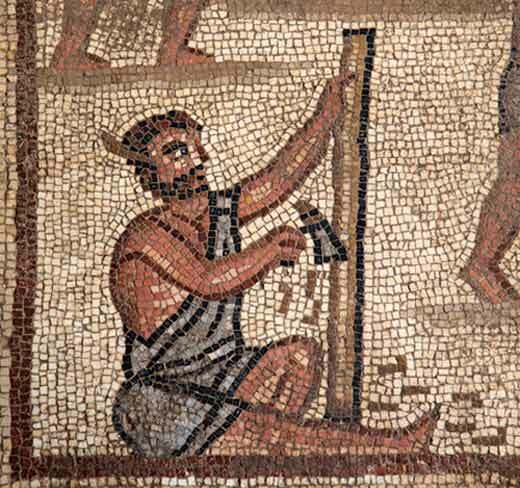 The work this season focused on the southern part of the synagogue’s nave, where a series of mosaic panels decorating the floor was exposed (Fig. 1:1–4). The mosaic floor is delineated by the line of the synagogue’s west stylobate, which was robbed out some time before the Middle Ages, and by a cut that was made when raising the east stylobate during reconstruction in the Middle Ages. Architectural elements, which may be later additions to the synagogue, were found on top of two of the mosaic panels: a finely carved stone pedestal abutting the (robbed-out) western stylobate atop the Jonah panel (Fig. 1:2); and two stone blocks forming steps rising from west to east, which overlie part of the tower in the Tower of Babel panel (Fig. 1:3). Perhaps the steps belonged to a bema, in which case the rest of it was obliterated by the medieval stylobate to the east. A layer (c. 0.1 m) of earth lay immediately above the mosaic floor, and several accumulations of soil mixed with rubble—perhaps the result of robbing activities connected with the construction in the Middle Ages—were revealed above it. Among these accumulations were small- and medium-sized architectural elements and two non-joining fragments of a large, free-standing, three-dimensional marble menorah. The accumulations were covered by plaster leveling surfaces associated with the medieval floor above. Numerous architectural elements from the Late Roman synagogue were reused as supports for the stylobate of the medieval public building and are embedded in the stylobate’s buttresses. Among the items found while dismantling two of the buttresses at the southwestern end of the east stylobate, inside the nave, were three complete decorated voussoir stones, which presumably belonged to a large arched window above the main doorway in the synagogue’s south wall. The mosaic panels uncovered in the 2017 season comprise (from north to south): a zodiac cycle panel (Fig. 1:1), two large panels depicting rare biblical scenes of Jonah (Fig. 1:2) and the Tower of Babel (Fig. 1:3), as well as smaller panels (Fig. 1:4) containing a lion, eagles and an inscription enclosed by a wreath. The zodiac panel is framed by a guilloche border. The other panels are framed individually by simple fillet borders. The nave mosaic panels are all enclosed within a wide border composed of rectangular panels depicting animal-chase scenes alternating with geometric motifs. All of the mosaics are oriented towards a viewer entering through a main door in the center of the synagogue’s southern wall. Zodiac Cycle Panel. Excavations down to the synagogue floor in the nave completely uncovered a zodiac cycle panel that was partly exposed in 2016. Due to a collapse on the floor, the mosaic panel is incompletely preserved. 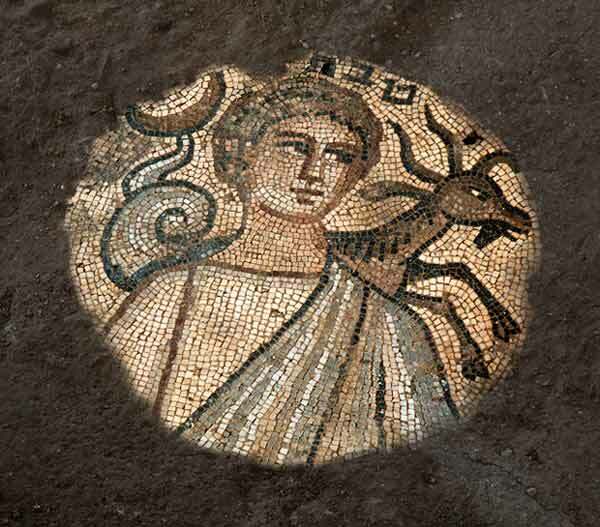 The Helios medallion at the center of the mosaic preserves a moon, stars, rays, a chariot and four horses. However, damage to the Helios figure makes it impossible to determine whether he was depicted as a personification of the Greco-Roman sun god or was represented aniconically by a sun disk. Only three of the twelve months encircling the Helios medallion are well preserved. They are depicted by personifications of the months labeled in Hebrew and accompanied by their corresponding zodiac signs (Fig. 2). Each corner of the zodiac cycle panel contained a personification of a season; however, only the corner showing Tishri (autumn) is well preserved. Jonah Panel. The panel, located to the south of the zodiac cycle panel, depicts Jonah being swallowed by three large fish. The Jonah episode is set within a dense scene of various types of marine imagery, including diverse species of fish and other sea creatures, as well as boats occupied by men engaged in a range of activities related to sailing and fishing. The depiction of three Harpies in the sky—half female and half bird personifications of storm winds in the Greek and Roman mythology—refers to the circumstances leading to Jonah’s plight. Tower of Babel Panel. The panel, located to the south of the Jonah panel, depicts at the center of the scene a tall, square tower that is under construction by workmen carrying stone blocks. An elaborate pulley system for lifting of construction materials stands next to the tower and is operated by manpower. On each side of the tower and pulley are depictions of construction activities, including the quarrying and transportation of stone, as well as sawing, planing and chiseling of wood (Fig. 3). Divine punishment for constructing the tower is represented by the deaths of some of the workmen, who are shown falling headlong from the scaffolding and the ropes of the pulley, and by a violent fight between workmen. Lion, Eagles and Inscription Panels. Four mosaic panels were partially exposed side by side, each framed by a simple fillet border, to the south of the Tower of Babel panel and along the line of the synagogue’s south wall. They contain a large lion; two eagles perched on vessels or pedestals placed on the heads of centaurs (or riders and horses); and an inscription framed by a floral wreath. Based on the symmetrical arrangement and the two identical eagle panels, it is reasonable to assume that these are heraldic panels, which frame the inscription. Although the remains of the main doorway in the synagogue’s south wall have not yet been found, its location is indicated by the position of the wreathed inscription, which is aligned with the Helios medallion at the center of the nave. The remains of a monumental public building (total width c. 16.8 m; nave width c. 8.5 m; west aisles width 2.2 m; east aisles width 2.65 m) were exposed in previous seasons (Magness at al. 2017). This season’s excavation revealed an earlier phase in this public building. It was discerned in the northwestern corner of the building: the remains of the foundation of the corner and a negative outline in the floor—indicating the location of a bench—in front of the corner. In the later phase, the northwest corner was reconstructed, probably because of damage caused to the building while it was still in use. A doorway with a threshold of finely carved basalt blocks (Fig. 4) was set in the west wall at the corner (see Fig. 1) after the bench had been removed and the floor was repaired. The west wall continues northward, beyond this doorway. Another doorway, farther to the south, was set in the west wall; it is associated with two large threshold blocks that had been robbed out in modern times and were exposed in 2011. Although the western bench was robbed out, its line clearly stopped on either side of this doorway, thereby indicating its location. By the end of the 2017 season, the entire west wall of the building was exposed (length c. 24 m). In previous seasons, very small patches of mosaics were discovered in the north and east aisles of the medieval public building, abutting the stylobate and beside the bases of the benches. This season, a single in situ tessera abutting the inner face of the northern stylobate provided the first evidence that the nave had been paved with mosaics as well. The tessera was embedded in soft plaster overlying a thick layer of concrete-like floor makeup. In the 2017 season, the Medieval floor above the southern half of the Late Roman synagogue’s nave was removed to reach the mosaic floor. A thick layer of plaster that served as a working surface covered the fills of soil and rubble overlying the synagogue’s mosaics. Above this plaster were layers of leveling soil fills sealed by the thick, hard plaster floor of the building, which was not as well-preserved as in areas farther north. Two walls, oriented north–south and east–west, forming a corner around a cistern, were found in 2016 at the southern end of the nave. It now appears that this is not a bema, as we previously thought, nor does it seem to be a mihrab or a stylobate for a peristyle surrounding the cistern. These remains cover part of the southernmost mosaic panels in the Late Roman synagogue, including the panel with the inscription just inside the synagogue’s main entrance. This feature appears to be associated with the Medieval building. Hopefully, excavations in future seasons will clarify its date and function. A sloping ramp rising from south to north was exposed along the outer face of the northern end of the west wall. It may have been built after the ground level outside the building had risen. Evidence of robbing activity farther south along the west wall suggests that stone benches may have run along its outer face. Patches of later floors and wall stubs revealed inside the building attest to the intensive use of the building and activity within it long after its initial construction. As in previous seasons, structure walls that abut the outer face of the building’s north wall were revealed; it seems that they were built after the initial construction. Three phases of activity that took place after the public building went out of use were distinguished in Area 3000 (Phases 1–3; Magness et al. 2017). Phase 1 (thirteenth–sixteenth centuries CE) took place after the monumental public building from the Middle Ages went out of use and before fills were deposited above its floor. During this phase, building blocks were robbed from the northern wall, the western stylobate and the north and west benches; pits were dug in the area of the building; and walls and installations were constructed. The robbing and pitting activities continued into the nineteenth and twentieth centuries, as indicated by the modern fill found under the large threshold stones (revealed in 2011), which were associated with the doorway in the middle of the west wall of the medieval building, as well as in several pits. Phase 2 (eighteenth–nineteenth centuries CE). Additional ṭabuns, ash deposits and partition walls were discovered in an open area in the southern part of Area 3000. Phase 3 (late nineteenth and twentieth centuries CE). At the northern end of Area 3000, part of a modern house was excavated. At the southern end of Area 3000, a stratigraphically complex picture emerged: above the earlier ash-and-ṭabun layer (Phase 2), houses were built, covered by another ash-and-ṭabun layer, above which the latest (pre-1948) houses of the village were established; these included a large house excavated over several seasons (Unit III). Magness J., Kisilevitz S., Grey M., Mizzi D. and Britt K. 2017. Ḥuqoq – 2016. HA-ESI 129. 1. 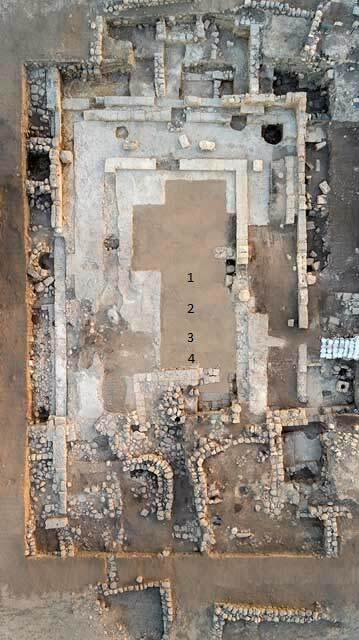 Aerial view of the Late Roman synagogue and the medieval public building in Area 3000 at the end of the 2017 season; north is at the top. 2. Personification of the month of Tevet with the sign of Capricorn in the zodiac panel. 3. Workman chiseling wood in the Tower of Babel panel. 4. Doorway with basalt threshold in the northwestern corner of the medieval building, looking east.